Locations: Cypress Hills Eco-Adventures Ltd. and Elk Ridge Eco-Adventures Ltd.
Before you begin...you need to know this! Previous experience and relevant technical skills are helpful, however, the most important characteristics that we look for are personality, willingness to learn, attitude, and interpersonal skills. Please answer all questions to the best of your ability. Also, if you haven't viewed our video yet...please give it a watch! Experience required: none. Must be 19 years of age as of January 1st, 2015. Must be available to work until the end of Labour Day Weekend. Start date will be determined later in the hiring process but will be no later than the first Monday in June. Brief Description: Must be able to work responsibly and co-operatively with colleagues to safely guide groups of up to 8 to 10 people on a 2-hour zip line canopy tour through forested areas on zip lines, suspension bridges, and designated pathways, ensure that all safety requirements are followed by participants, communicate knowledgeably and effectively the goals and nature of the facility, demonstrate sincere enthusiasm for and enjoyment of outdoor adventure activities, effectively model your work-life around the FISH! Philosophy principles (Play, Be There, Make Their Day, and Choose Your Attitude). 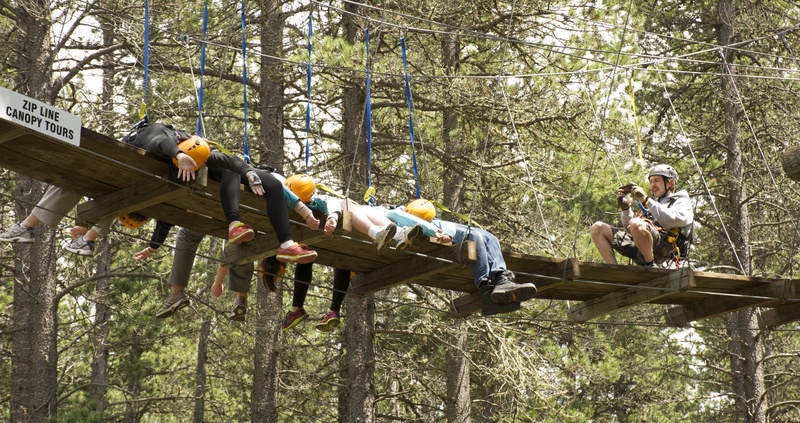 There will be up to twelve (12) zip line canopy tour guide/facilitator positions available at each location. Pay type: $13/hour + photo commissions + tips + potential end of season bonus (additional $1/hr worked). Work schedule: 4 days on, 2 days off. Must be available to work from the July Long Weekend until the end of Labour Day Weekend. Brief description: Must be able to work responsibly and co-operatively with colleagues to provide a positive and safe environment around BaseCamp; ensure that all safety requirements are followed by participants when using the climbing wall, treetop drop, and slacklines; communicate knowledgeably and effectively the goals and nature of the facility; demonstrate sincere enthusiasm for and enjoyment of outdoor adventure activities; effectively model your work-life around the FISH! Philosophy principles (Play, Be There, Make Their Day, and Choose Your Attitude). There will be between one (1) and six (6) BaseCamp Crew positions available at each location. Pay type: $11/hour + tips + potential end of season bonus (additional $1/hr worked). 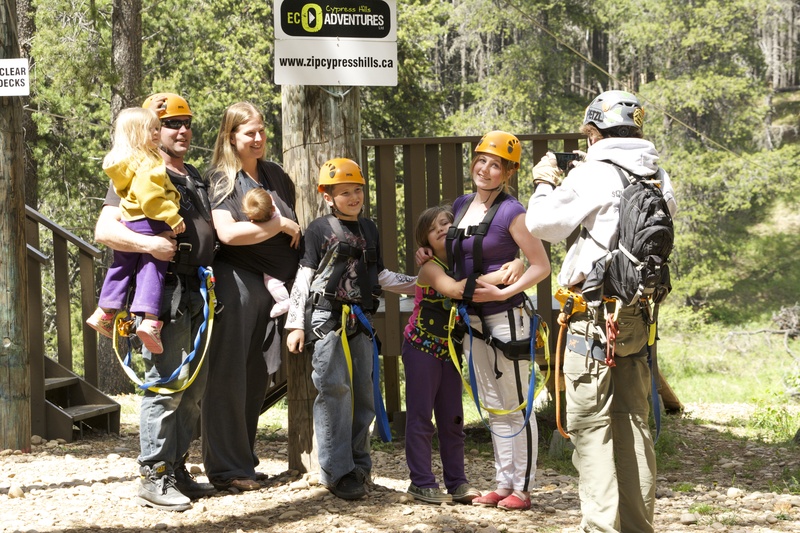 Cypress Hills Eco-Adventures Ltd. (SW) Elk Ridge Eco-Adventures Ltd. (N) No preference, I just want to zip line all day! be considered for a Guide/Facilitator position. Do you hold a valid first aid / CPR certificate? Do you hold a valid fall arrest certificate for the province of Saskatchewan? BE THERE - Describe a scenario when you had to put the needs of someone ahead of your own. What made you respond to them in the way you did? What was the result of your actions? MAKE THEIR DAY - Describe a moment when you went above and beyond to make a person's day better. What was the person's reaction? How did it make you feel? CHOOSE YOUR ATTITUDE - Describe a situation when you had to check your emotions at the door in order for you to accomplish a task without letting negativity affect yourself or others around you. What was your though processes that helped you accomplish this? What was the result due to you consciously choosing your attitude? Where would you like to be, personally and professionally, within the next five (5) years? Please list two (2) references below. One should be a former employer and the other should be a former teacher or professor. Upon receiving your application, we will send out online reference check forms to the individuals listed below. PLEASE NOTE: We must receive completed forms back from them before we will move forward with an interview, so make sure that you let them know to check their email and spam folder during the 48 hour period after the moment you submitted you application. Please forward this link - http://www.jotform.ca/form/43085561135250 - to the above individual and direct them to complete the online reference check on your behalf. This will need to be completed in order to proceed with your application. Please forward this link - http://www.jotform.ca/form/43085740800248 - to the above individual and direct them to complete the online reference check on your behalf. This will need to be completed in order to proceed with your application. Are you able to commit to working until the end of Labour Day Weekend should you be offered a position? If hired, would you be interested in extending your contract until the end of Thanksgiving Weekend if possible and weather permitting? Are there any obligations on your behalf which may prevent you from attending all work shifts should you be offered a job? If so, please list them below and include dates. Please disclose your plans for accommodation for the 2015 season below or let us know that you will follow up at a later date. All accommodations must be confirmed prior to April 1st, 2015. You will not be offered a position until you have confirmed accommodations for the duration of the season. Expected time to receive a response regarding your application: At this time, the closing date for the next round of hiring is February 1st, 2015. You will receive an email after February 1st, 2015 from jori@ecoadventures.ca should you be selected for a phone or in-person interview; the type will depend on where you live. In this email you will be asked to confirm a time for this interview to occur. Please add the above email to your address book to ensure that this email can arrive safely. You have reached the end of our application. Please thoroughly read the disclaimer below and then click "Submit Application". I understand that misrepresentation or omission of facts may result in rejection of this application, or if hired, discipline up to and including immediate dismissal. I hereby authorize Cypress Hills Eco-Adventures Ltd. or Elk Ridge Eco-Adventures Ltd. to thoroughly investigate my background, references, employment record and other matters related to my suitability for employment. I authorize persons, schools, my current employer (if applicable), and previous employers and organizations contacted by Cypress Hills Eco-Adventures Ltd. or Elk Ridge Eco-Adventures Ltd. to provide any relevant information regarding my current and/or previous employment and I release all persons, schools, and employers of any and all claims for providing such information. I understand that I will be required to sign confidentiality and/or a non-competing agreement, should I become an employee of Cypress Hills Eco-Adventures Ltd. or Elk Ridge Eco-Adventures Ltd. I understand that filling out this form does not indicate there is a position open and does not obligate Cypress Hills Eco-Adventures Ltd. or Elk Ridge Eco-Adventures Ltd. to hire me or contact me in the future. I understand that I may be asked to provide proof of age, certifications, credentials, proof of identity and legal work authorization, and failure to provide satisfactory proof may result in immediate termination of employment. I understand that Cypress Hills Eco-Adventures Ltd. and Elk Ridge Eco-Adventures Ltd. do NOT provide accommodations to their employees at this time. By submitting this application, I understand that it is my responsibility to find a place to live located nearby my place of work and/or have reliable transportation from my place of residence to the BaseCamp each day that I am scheduled to work. I have read and fully understand this employment application and I seek employment under these conditions. PLEASE NOTE: If this form will NOT submit (Jotform has been having a few issues as of late), please just send a resume and cover letter to jobs@ecoadventures.ca. This will ensure that your application can be processed for the time being and we will have you fill out the official online application when it becomes available. Thank you!